The Divine Mercy devotion is comprised of many aspects: the Feast Day, the image, confession, the great Promise and Indulgence, the three o’clock hour, the novena and finally, the chaplet (Divine Mercy Chaplet). The power of the Divine Mercy chaplet is highlighted throughout St. Faustina’s diary, including the power to save the dying, the power to forestall divine justice, and even, power over nature. The primary intention of the chaplet is to save souls, especially sinners. Jesus tells St. Faustina, “At the hour of their death, I defend as My own glory every soul that will say this chaplet; or when others say it for a dying person, the indulgence is the same” (Diary, 811). This point is reinforced a number of times throughout the diary with concrete examples of the chaplet saving souls. 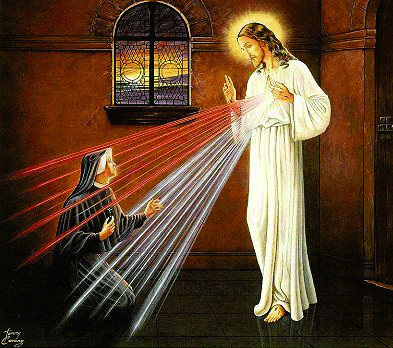 In one instance, St. Faustina is mystically transported to a dying sinner surrounded by a “multitude of devils.” As she prays the chaplet, she sees Jesus appear just as in the image and the rays from His heart envelop the man, saving him and giving him a peaceful death. St. Faustina realizes “how very important the chaplet was for the dying. It appeases the anger of God” (Diary, 1565). As Jesus had advised St. Faustina, “Say unceasingly the chaplet that I have taught you. Whoever will recite it will receive great mercy at the hour of death” (Diary, 687). St. Faustina also sees the efficaciousness of the chaplet to mitigate divine chastisement. On a number of occasions in the diary, she describes how reciting the chaplet disarmed an angel about to deliver imminent divine justice. In one instance, St. Faustina sees an angel, an “executor of divine wrath,” about to punish a certain part of the world. In trying to plead for mercy, she begins to pray the words of the chaplet. Then, as St. Faustina recounts, “As I was praying in this manner, I saw the angel’s helplessness; he could not carry out the just punishment which was rightly due for sins. Never before had I prayed with such inner power as I did then” (Diary 474). After a similar occurrence of angelic restraint later in the diary, St. Faustina proclaims “this chaplet was most powerful” (Diary, 1791). As if to reinforce the power of the chaplet, one day St. Faustina was “awakened by a great storm” of wind, torrents of rain, and thunderbolts. She then was prompted to pray the chaplet so the storm would not harm anyone. As she recounts, “I began immediately to say the chaplet and hadn’t even finished it when the storm suddenly ceased, and I heard the words: “Through the chaplet you will obtain everything, if what you ask for is compatible with My will” (Diary 1731). The Divine Mercy chaplet is a powerful way for us to show mercy towards others through prayerful intercession. It is particularly fitting during Easter time with the chaplet’s Paschal and Eucharistic language. Each time we pray the chaplet, we offer to God the Father the passion and sacrifice of Christ, on behalf of our sins and for those of the whole world. It is a microcosm of the Mass in prayer form. The Divine Mercy devotion inevitably leads us to the sacraments, especially Confession and the Eucharist, which we can partake in this Sunday for the Feast of Divine Mercy.